The Swim Stirrup® has been carefully engineered to provide safe, easy access to small boats for swimmers or water skiers. Durable, reliable design attaches to gunwales, transoms, or open bows. Easy to install, easy to useit even floats! Perfect for rowboats, ski boats, dinghies, sailboats Adjustable length to fit your boat. Complete hardware and instructions included. Boarding ladders allow boaters to get in and out of the water from the deck or swim step of a boat and aid in boarding from a dinghy. Although they can sometimes be used to help in the retrieval of a crew member who has fallen overboard, they are typically of little or no use in rough seas. Boat ladders must extend below the level of the water to be effective. We like ladders with at least 2-3 rungs below the surface, which means they must either fold or be removed when underway. Over-the-gunwale ladders for runabouts and small sailboats. These have hooks that vary in width to match the width of the gunwale. Swim step ladders hang down from powerboat swim steps and usually contract underneath or fold up on top of the step. 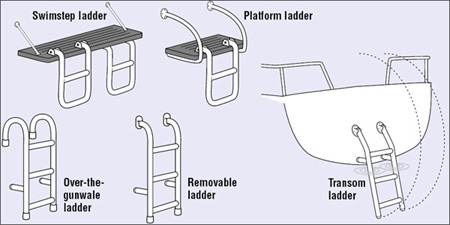 Since the swim step is so much lower than the side of the boat, these ladders generally need only 1-3 steps. Platform ladders create a mini-swim step on one side of the outboard or outdrive. These come with a platform and side rails. Transom ladders on sailboats hinge up and down and generally match the appearance of the pushpit. Removable ladders fit in brackets bolted to the hull or deck. The brackets have keyhole slots that hold the ladder securely, yet allow it to be removed quickly for storage. Many ladders fold in half so they can be left in place without dragging in the water. 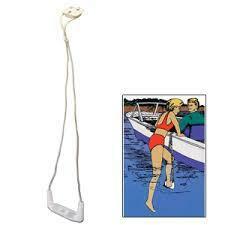 They can be used while folded when boarding from a dinghy and extended when swimming. They are also easier to stow. "Rope" ladders are flexible, collapsible and lightweight, but they’re not ideal as a primary ladder because their flexibility makes them difficult to climb. Try in calm water before you rely on them as your sole reboarding method. Ladders should be mounted so that the steps extend far enough into the water to make climbing aboard as easy as possible and at a spot that’s convenient for boarding. For example, stern ladders are quite common on sailboats, but this is frequently where the motion of the boat is the greatest. On sailboats with a fixed pushpit, a better place may be on the side, near the cockpit, where the lifeline gate is located. We like broad, nonskid treads, since 1" stainless tubing is remarkably painful under bare feet. We also like ladders that stand off away from the side of the hull, because they provide finger and toe clearance. Side rails that extend above deck level provide a handy place to grab. Ladders are made from noncorroding materials like stainless-steel, aluminum and plastic. Aluminum is lighter and less expensive, while stainless-steel looks better and is stronger. Plastic treads are fine and are quite comfortable.